This is an ongoing adventure for us so stay tuned for different crafts and activities you can do with your children as you learn about the unique qualities of each tribe. There are so many opportunities for children to learn about art in general as well as explore historical techniques. Often Native American artwork was made from natural resources found among their surroundings, so for each tribe children can learn about the different materials and mediums used for textiles, basketry, weapons, clothing, artwork and more. History Pockets-Native Americans, Grades 1-3, Contains nine memorable discovery pockets. The introduction pocket gives an overview of the tribes in North America that are featured. The other pockets focus on food, clothing, shelter, and family life of eight Native American tribes. Each of the pockets contains a reproducible pocket label, three dictionary words and pictures, plus a shelter stamp, a fact sheet of background information for the teacher, a reproducible students information booklet complete with illustrations, arts and crafts projects and writing activities. Here are crafts we made while learning about the Inuit Tribe. 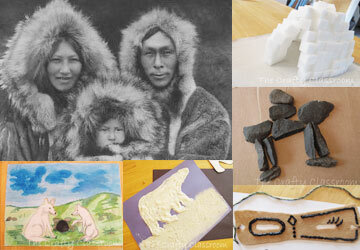 You'll find Igloos, Snow Goggles, Soapstone Sculptures, and more! These are the crafts and activities we made while learning about the Tlingit Tribe. 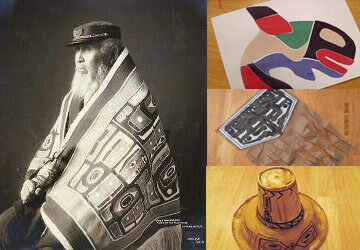 These crafts work well with other Northwest tribes as well.